Bundaberg is a progressive city of 45,000 people servicing a district of 70,000. Bundaberg was named in 1867, the name coming from the linking of "Bunda" the name of an aboriginal elder and "berg" being a variation of an old Saxon word for town (burg). These days a more familiar version has surfaced with the name being shortened to Bundy for use in conversation. With the Great Barrier Reef just off our shores and a host of things to see and do, Bundaberg is a great place to visit. The first place to visit is the Information Centre which is open daily except Christmas Day and Good Friday. Hours are generally 9.00am to 5.00pm with some exceptions on public Holidays. The Centre is situated next to the Public Hospital on the corner of Bourbong Street and Tallon Bridge. 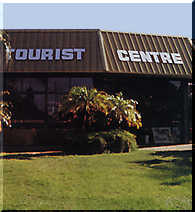 The Centre offers information on the region and makes bookings for tours, island flights and cruises. Of additional interest is the replica of Bert Hinkler's glider and models of his aircraft. Bourbong Street has been transformed into a tropical streetscape with the bright colours of flowers blending with fountains and leafy green trees. A central pavilion provides a venue for entertainers. There is plenty of free parking in the area but please observe the time restrictions. The Whaling Wall is a dominant landmark in the city providing a year round reminder of our marine friends. The Burnett River flows through the city and divides Bundaberg in two. A road bridge, restored in heritage colours and rail bridge cross the river from the centre of the city to North Bundaberg. An additional road bridge crosses the river from Bourbong Street near the Tourism Information Centre to Hinkler Avenue. The Tallon Bridge was named after a notable Bundaberg cricketing family. The river is a place for recreation catering for fishing, boating, rowing, skiing upriver at Sandy Hook and sailing downstream near the port. Parks grace the river banks; on the city side are Anzac, Alexandra and Queens Parks and in the north side Lion's Park is under the bridges. Upstream from the city is the barrage which holds back fresh water for irrigation and city water supplies. Further upstream the Burnett is home to the platypus and unique ceratodus (lungfish). 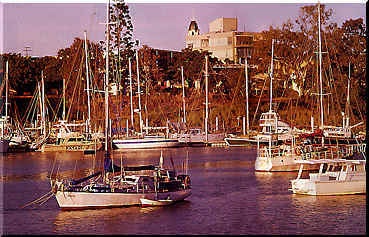 The river also has commercial uses with trawlers, dive and charter craft using Bundaberg as a base. Bundaberg ranks with Cairns and Coffs Harbour as one of the three principal clearing ports for visiting yachts on the east coast. Midtown Marina is a facility of international standards providing berth and moorings for commercial and pleasure craft.